A family from the Borough have become only too aware of the issue of “car dooring” since a personal family tragedy in July 2016 when their son Sam Boulton was knocked off of his bike and sadly passed away after being struck by a taxi door pushing him into the path of a van. Car dooring is when a driver or passenger opens a vehicle door into the path of oncoming traffic, resulting in a collision or avoidance manoeuvres, such as swerving or braking, which may also result in injury or even death. After the accident the family took a lot of taxi journeys and noticed that there was nothing in the taxi’s to advise people of their responsibilities when getting out of a vehicle into the oncoming traffic. This is what sparked the family’s idea to create stickers to put in vehicles to remind people to check before they open the door. The campaign promotes using the Dutch Reach when opening the door of any vehicle whether it’s your own or a taxi. The Dutch Reach is a practice for drivers and passengers where, rather than using your hand closest to the door to open it, you use your far hand. This forces you to turn your body round and enables you to see any cyclists, pedestrians or oncoming traffic. 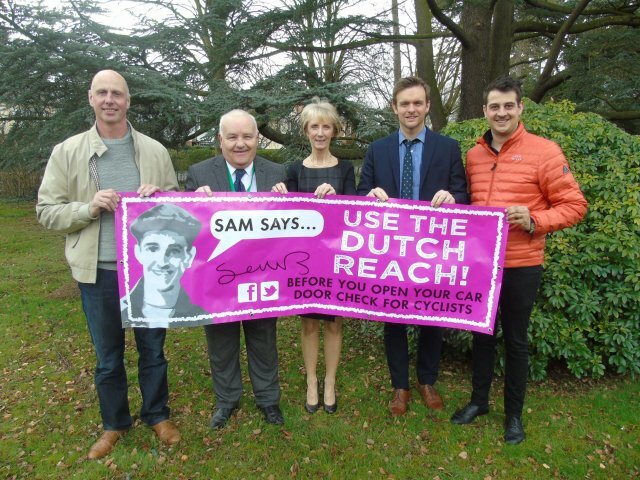 Sam’s father, Jeff said: “People need to be aware of the life-threatening dangers of opening their car door onto the road without carefully checking for cyclists first. The family are working with Oadby and Wigston Borough Council to push their campaign even further by providing stickers and leaflets for all Oadby and Wigston Borough Council licenced taxis. The stickers will go on the inside of the taxi windows to remind people to check for cyclists before they open the door. Sam’s father, Jeff and brother, Joe came to the Council Offices on Station Road on 8th March 2019 to share information about the Sam Says campaign and to provide the stickers now being distributed to taxi drivers by the Council. They were greeted by the Head of Law and Governance, David Gill, the Chief Executive, Anne Court and the Director of Finance and Transformation, Stephen Hinds, pictured below with one of the campaigns promotional posters. David Gill said: “ The Council is pleased to be able to support the family’s campaign to promote road safety. We ask all taxi drivers licensed by the Council to join in with this campaign in the hope that it prevents any other family from experiencing the loss of a loved one caused by momentary lack of observation’.